Indian census data reveal one very important information about our states. It reveals the states that are most feminist controlled. Feminists have always considered marriage as a major oppression for women. The main reason behind bringing all gender biased family breaking laws are also the same. 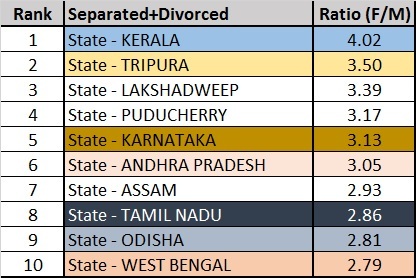 Thus by analyzing the information of divorced and separated women in different states, we get a fair idea of most feminized states in India. 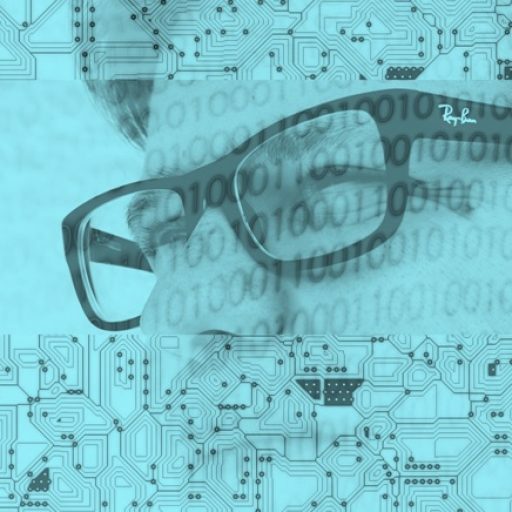 Since the population of a state may vary depending on its area or population density we have considered the ratio of female and male population in each case to understand the divorce situation in each state. As per census 2011, in terms of gender ratio of separated individuals, Kerala tops the chart with a staggering 3.8 times women in that category compared to a number of men. 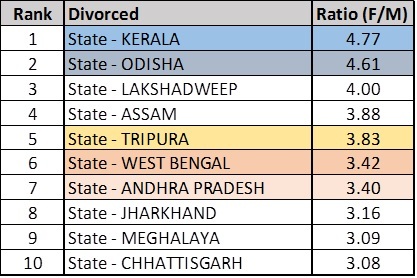 Tripura is second with the ratio being 3.3. The smaller states like Andaman Nicobar and Lakshwadeep need to be ignored for all practical purpose of study because a small switch in numbers can skew the statistics. It is evident that the states influenced by communism are worst affected by feminism as well. 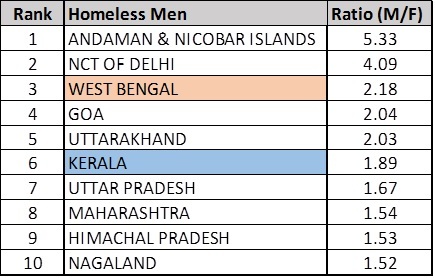 We find Kerala and West Bengal in leading positions in breaking family as well as creating homeless men. Other communist infested states like Tripura, Andhra Pradesh, and Odisha can also be seen in the list. Recently, these are the same forces that rallied behind Yakub Memon. Time to ask, if our internal political parties used to break this country? Looks like same forces carry out separatist movement in some states and they also carry on a systematic movement to break our family system in the name of feminism. This once again proves #FeminismIsTerrorism. Next Trailer Review: FAN – This Might Be SRK’s Most Promising Venture To Date! So, is Kerala a communist state? 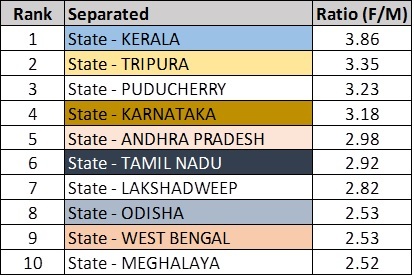 Yes..communist ruled..in fact the two states Kerala and West Bengal are most communist states..
One interesting fact is that states like Karnatak, Tripura, Tamil Nadu have a below-replacement birth rate. It’s just sad to see feminism has affected Indian women in so little time. I remember how different women were in 2008. That’s was when I had gone abroad for studies. That was just 7 years ago… When I came back to India last year, it seems the social landscape has changed so much. Women, at least in the metros, have become extremely rude and treat Indian men like crap. 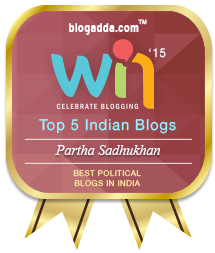 By the way, good to see your blog is still active, it’s one of thew few ones dedicated to issues Indian men face. 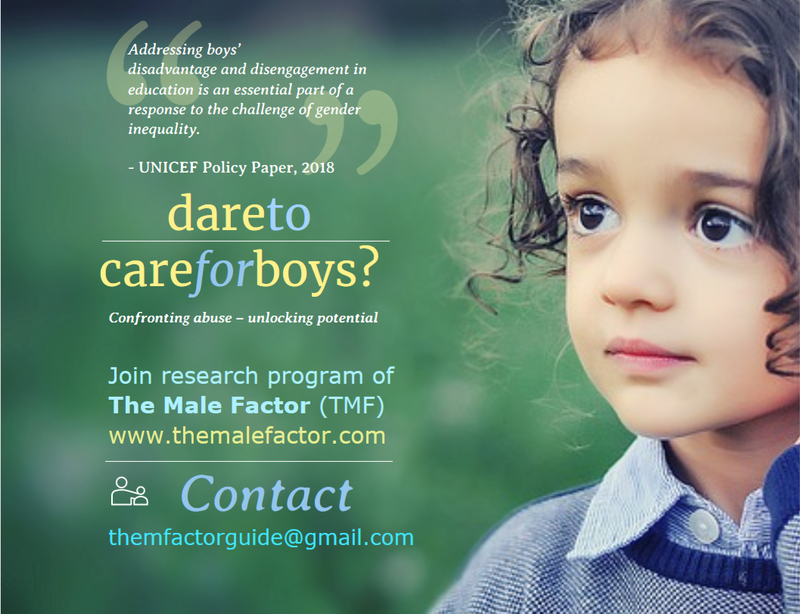 No, we from Indian men’s rights will never allow feminists to succeed. Probably you don’t know today, feminists have taken a backseat. 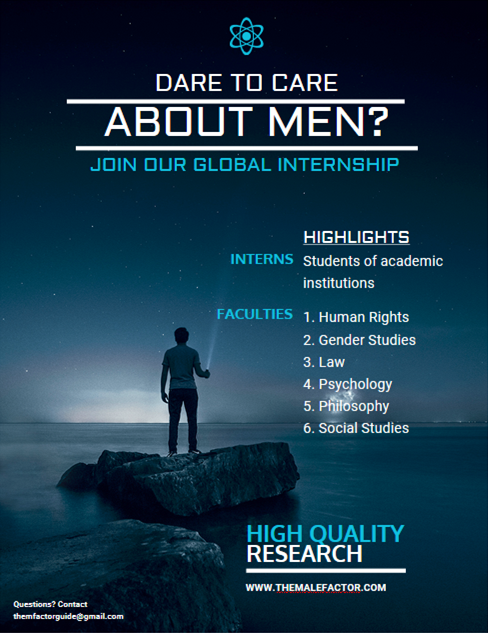 Suicide rate of Indian men have come down significantly in 2013 and we are taking it as trend reversal.